So Charlize and I were out Christmas shopping for Kelly a couple months ago. 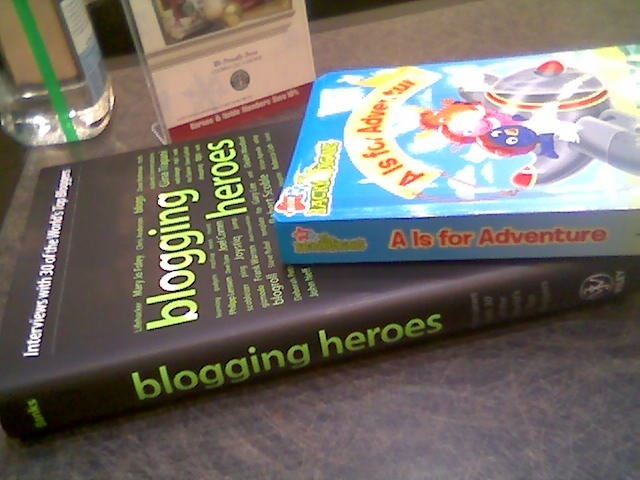 We went to Barnes and Noble to see if there were any good books for Mommy. We entered the store on the second floor through the kids section, so I grabbed a book for Charlie to read while I was shopping. While walking through the store, we got lots of looks. 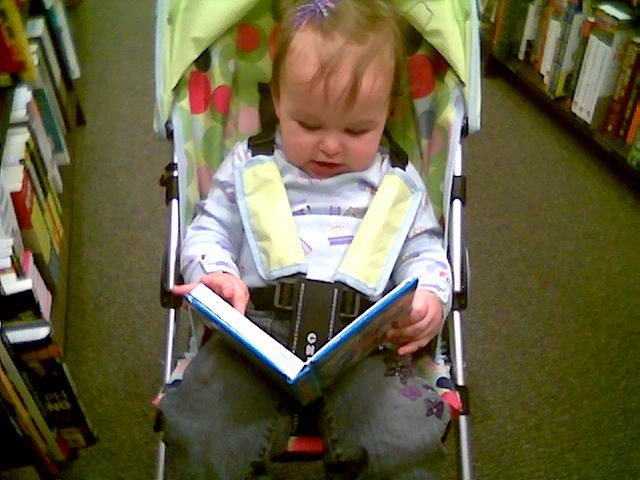 I guess people have never seen a (then) 15 month old reading in her stroller. What do they expect her to do in a bookstore? Just sit there? Well, apparently, the book was too elementary for her because, as you can see from the pictures, she finished it in a hurry. She even read it 2 or 3 times. Well, I was browsing the books and saw one that interested me, even though I was supposed to be shopping for my wife. I stopped the stroller on the side of that aisle and took a quick look at the book. (I don’t even remember what it was anymore.) 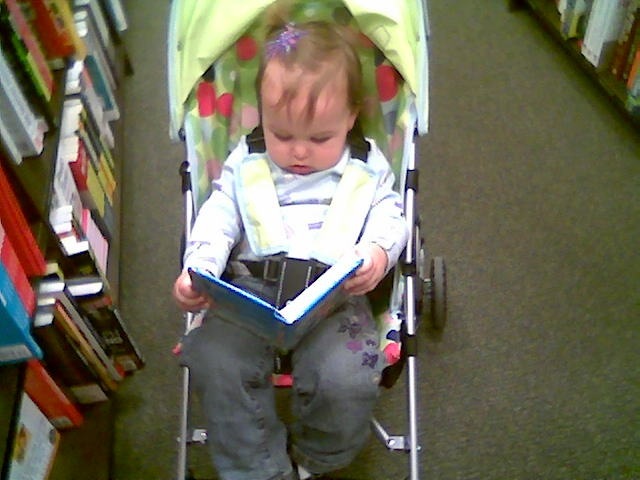 Since Charlie had already read her book 3 times now (maybe even 4 by this point), she started looking around and found one that looked particularly interesting to her. She leaned forward in her stroller and grabbed this one off the shelf by herself. Seriously. She almost dropped it, but when I saw what she was doing I helped her out. The book she picked? 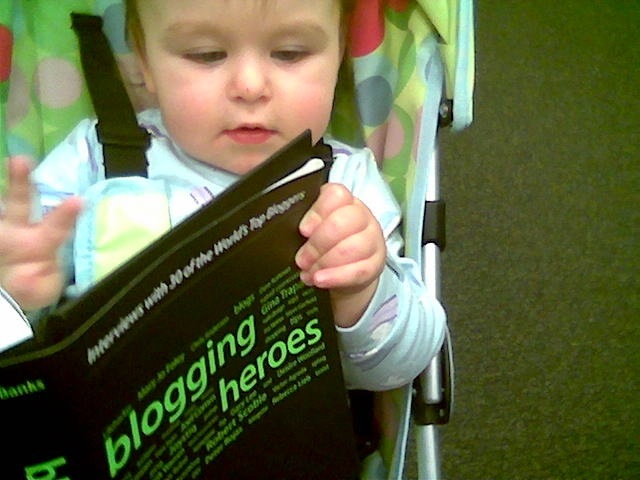 Blogging Heroes: Interviews with 30 of the World’s Top Bloggers. I’m not sure what interested her most: the interview with Mary Jo Foley or the one with Robert Scoble. In either case, she really seemed to be attached to this one and had no interest in me putting it back on the shelf for her. She read this book for a while, but never finished it. I think it was physically just too heavy for her little hands. 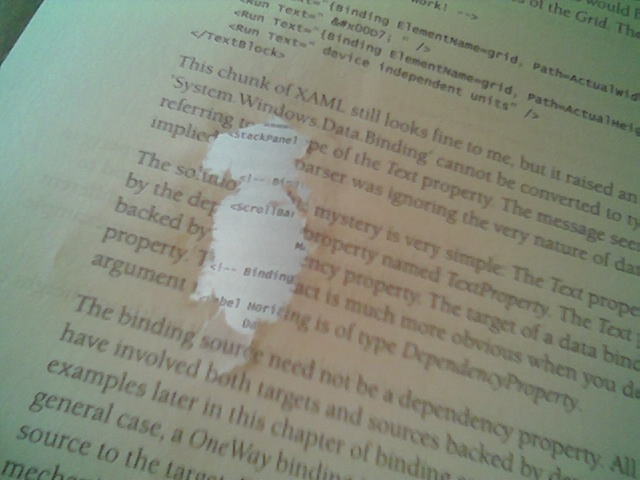 Either that or she got frustrated reading about The Unofficial Apple Weblog. Eventually, we left it with the first book on a table in the coffee shop after drinking a venti something-or-other and a bottle of Fiji water. I’m thinking I should add it to her Amazon wish list. I know I will undoubtedly miss many moments in her life, but I want to keep that to a minimum. When possible, Kelly and I try to capture as many things on camera as we can so that we always remember those moments that we don’t miss. And so we can share them with family and friends who don’t get to see her very often. Thank God for camera phones. 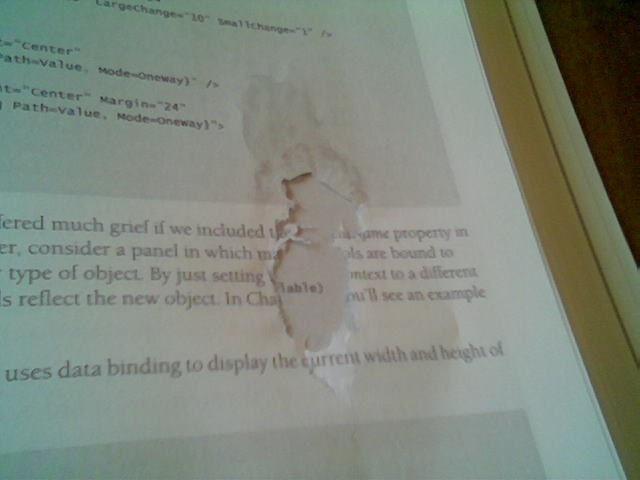 If you think back, you may remember that I blogged about a being a technical reviewer for an upcoming O’Reilly book. 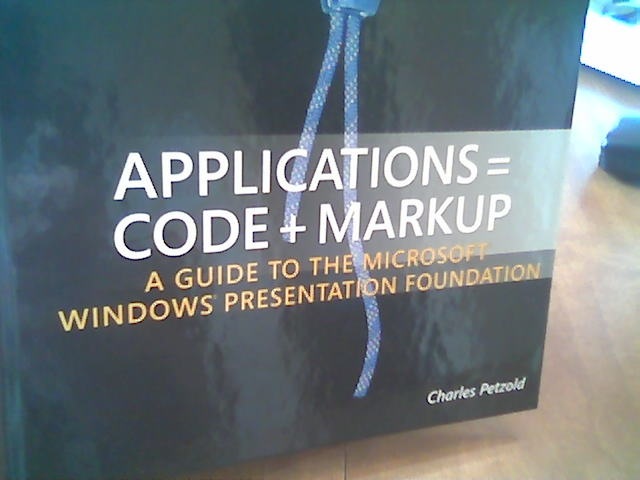 Well the book has just been published, and I got a copy in the mail today. In the O’Reilly tradition, it has an animal on the front cover — a catfish. If anyone buys a copy, I’d be happy to sign it for you. You know, now that I’m famous… and published… sort of… in that “I didn’t really write anything — I just read the book” sort of way. Update: A co-worker pointed out that my name was listed in the credits at the end of the introduction. I didn’t even realize that I had been mentioned in the book. Now you have to buy it. It’s not really a New Year’s resolution, but I’ve decided to try to read more. Here is a list of books that Auren Hoffman — a friend, and former boss — has read in 2005. He has highlighted his highest recommendations in orange. Unfortunately for me, I am color blind and can’t seem to see the color difference on my latpop screen. So I picked through the HTML, found the most recommended ones, and have listed them here. Since I don’t have a list of my own, I’ll probably use Auren’s list as a starting point. I’ve already read the Feynman book, and I have recently purchased Blink (audiobook) and Freakonomics (hardback), so I should be busy for a while. Well, it looks like I am officially a tech reviewer now. About a month ago, I mentioned that I had met a Sr. Editor from O’Reilly while in Orlando. Well, last week he e-mailed me to ask if I was interested in reviewing a new VB book that they’re putting together. Of course, I said yes, so he sent me the book (actually, just a few chapters of it so far), and I read it. I finished reading it a few days ago, but wanted to review one chapter again, so I just sent it back to him today with my notes. Surprisingly, this whole process seems to be pretty informal. I got a bunch of Word docs (one for each chapter, appendix, etc. ), and an 8 question survey. That was pretty much all I got. I made my notes using Word’s revision functionality and just sent back the updated files. Hopefully I’ll get to see the rest of this book before it’s published. There are a couple chapters that sound interesting.